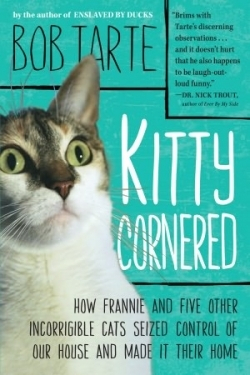 When a story opens with a cast list of the cats in the house and a map of the spaces they commandeer, readers quickly surmise that this is not a typical cat book. It is instead an affectionate look at the idiosyncrasies of each creature, as well as the author’s weaknesses regarding them. Although Tarte and his wife already shared space with ducks, geese, rabbits, parakeets, and parrots, they befriend stray felines until six of them are living in the same house. The author extols the virtues and vices of each animal, providing readers with a well-rounded viewpoint of life with this many pets. Lucy is incapable of properly using a litter box and Mabel, a wrongly named male cat who quickly becomes Maynard, wails if he is not petted on an almost constant basis. When Moobie is diagnosed with cancer and must wear a head funnel to keep from licking a wound, she becomes a “feline sun burning brightly in a terrible cosmic void—the countenance of a fussy cat goddess commanding tribute from her human subjects.” The author also shows the compassionate side of these creatures and, in turn, his own compassion and the great lengths to which he and his wife go when one and then another of their charges is hurt or ill.
Cat lovers will readily relate to Tarte’s insistence that cats are as individualistic and quirky as humans, while non-cat lovers will gain a deeper appreciation for these animals and the people who live with them. Foul Weather, of 2009, is Tarte’s previous book.